Travel northbound on I-95 until Exit 311 (landmark: St. Johns County Flea Market). Turn east (right) onto State Road 207, following it approximately 6 miles to the intersection of SR 207 and US 1 (landmark: Winn Dixie on the right). Turn north (left) onto US 1 and travel approximately 1/2 mile to the intersection of US 1 and King Street. Turn east (right) onto King Street (heading into the Historic District) and travel approximately 2/3 mile to the intersection of King Street and St. George Street (the 5th traffic light - landmark: Trinity Episcopal Church). Turn south (right) onto St. George Street and travel 2 blocks. Our parking lot is on the right side of the street, identified with a sign that reads: St. Francis Inn Guest Parking. Please park your vehicle and join us in the Main Inn across the street. Travel southbound on I-95 until you reach St. Augustine's first exit - Exit 318 (landmark: Factory Outlet Malls). Turn east (left) onto Route 16 and travel approximately 6 miles to the intersection of S.R. 16 and US 1 (landmark: CVS Drugstore on right). Turn south (right) onto US 1 (Ponce de Leon Blvd.) and travel to the intersection of US 1 and King Street. 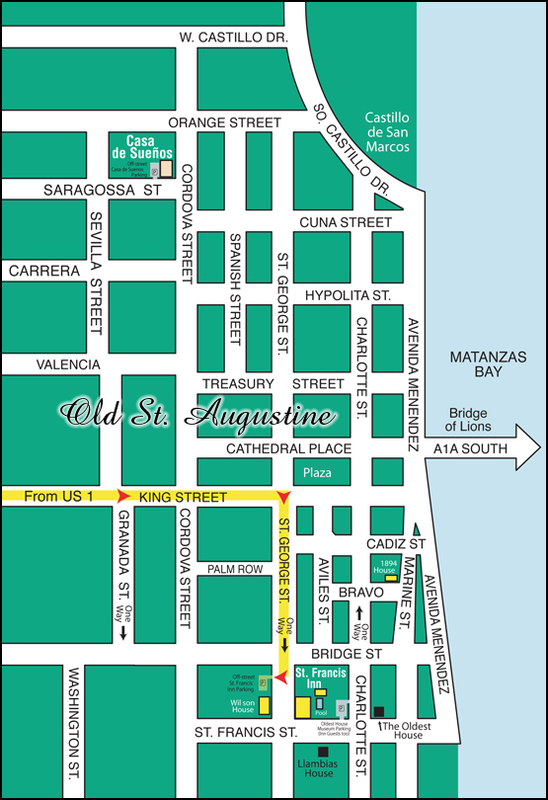 Turn east (left) onto King Street (heading into the Historic District) and travel approximately 2/3 mile to the intersection of King Street and St. George Street (the 5th traffic light - landmark: Trinity Episcopal Church). Turn south (right) onto St. George Street and travel 2 blocks <NOTE: This section of St. George Street is open to vehicular traffic one-way, north-to-south>. Our parking lot is on the right side of the street, identified with a sign that reads: St. Francis Inn Guest Parking. Please park your vehicle and join us in the Main Inn across the street.